Boverton Village & Castle : Neolithic Tinkinswood & St Lythan Burial Chamber. The Vale of Glamorgan is at the southern-most tip of South Wales and had a host of places to visit in Wales such as villages, hamlets, historical buildings and sites. 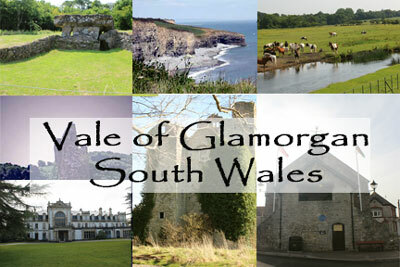 The Vale runs from Penarth (nr Cardiff) in the East to Ogmore-By-Sea in the west. At the northern boundary runs the M4 motorway that marks the border with the county of Rhondda Cynon Taff - to the west is County of Bridgend and to the east the County of Cardiff. Running right through the centre of the Vale of Glamorgan is the A48 trunk road, that at one time was the main trunk road connecting South Wales to London - a trip that I frequently made in my youth which back then was considered a busy, but "good" road, due to the centre lane for over-taking. But the road could be used by traffic travelling in both directions! Needless to say, there were many bad head-on collisions but nowadays the overtaking central lane is gone and the A48 is relatively quiet, unless there is some mishap that blocks the motorway and then it becomes grid-locked! But back to the Vale of Glamorgan. Further Posts/Articles relating to Vale of Glamorgan, Wales, see archive list in right hand column or for convenience, use links at top of this post. Please feel free leave comments.